I have tried clearing cookies and history and anytime I apply this comes up in the introduce yourself section. Why does this always come up? Is it stored in the database for my profile? How do I ever wipe this out completely? Obviously this isn't stored in a cookie. My thought was we should NEVER save the introduction. When you apply for a new job it is up to the person applying to reintroduce themselves. 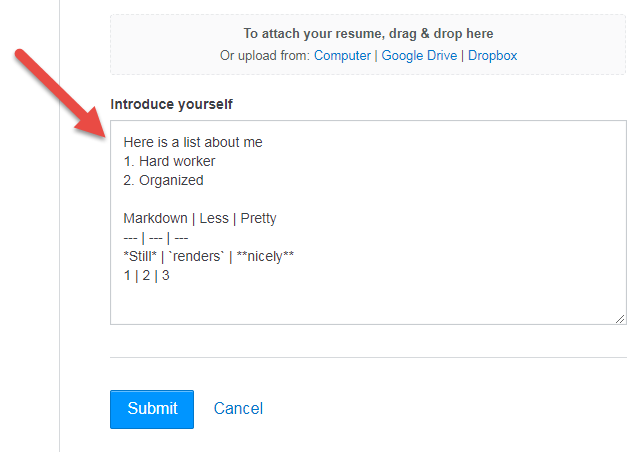 How is the "Introduce Yourself" section rendered to the employer? Cover letters are indeed saved and restored for the next application. It is a convenience feature. Applicants who change their cover letters for each job application are in the minority, and about one-fourth of applicants never change their cover letters when applying to multiple jobs. We used to avoid re-populating the cover letter on subsequent applications, but we changed that decision in part due to the data I just cited. There is currently no way to disable this feature, though we might revisit if there is enough demand. Not the answer you're looking for? Browse other questions tagged bug status-bydesign jobs . Why does Jobs save my cover letter between applications, but not my preferred skills in search?